The IoT market is growing rapidly. Mobile connectivity is becoming more and more a key success factor for many IoT projects, as most use cases are designed for mobility. But even for scenarios with immobile endpoints it often makes sense to include mobile connectivity as a fallback option, especially for time critical services. The proposal idea is the “wherever SIM” that provides the network coverage wherever devices may roam – integrating 400+ radio networks in 160+ countries all around the world. SIM cards and endpoints can be easily managed in real-time via the intuitive user-interface or directly from the customer’s software application via an easy-to-integrate API. The developing process, key features and security issues will be discussed. 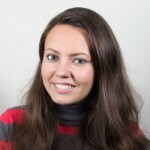 Karina Popova is a Dev/Ops, M.Sc. with wide range of education background in Informatics, Economics and Geospatial Technologies and deep technical experience, based on international professional interactions with representatives of government institutions & companies with agile environment across the world.